The pressure compensation plug equalises the pressure that occurs, due to temperature differences, inside the enclosure with the outside environment, while reducing the risk of dust entering the enclosure. It compensates the pressure with high IP. In the enclosures pressure differentials can occur during extreme temperature variations, when this happens there is risk of dust and humidity inside the enclosure. Even with a slight overpressure, a waterproof membrane inside the plug allows air and humidity to leave the enclosure. In the opposite direction, it only allows dry air into the enclosure. Mounting with thread M40x1.5 with nut, recommended torque of 5 Nm (max. 10 Nm). For optimal pressure compensation we recommend to use two devices on opposite sides towards the top of the enclosure. Air permeability of 1200 l/h at a pressure difference of min. 70 mbar. AISI 303 stainless steel. Sealing gasket NBR. -45 °C to +80 °C. Round hole 40.5 mm diameter. Depth in the enclosure of approximately 9 mm. IP 66 / IP X9K. In certain locations there can be wide temperature variations especially over a short period of time, which creates pressure differences from the inside to the outside of the enclosure. The pressure plug equalises the pressure inside and outside the enclosure allowing air and humidity to leave, while only allowing dry air to enter inside the enclosure. 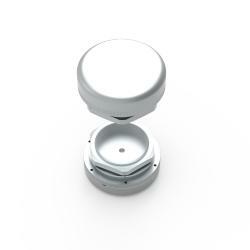 The plug can be easily installed and only requires a round hole to be machined . It is highly recommended to install two plugs per enclosure for optimal pressure compensation. The plugs should be installed both at the top of the enclosure but on opposite sides.